PORT-OF-SPAIN, Nov 05 (IPS) - Four Caribbean countries have done an inventory of the major sources of mercury contamination in their islands, but a great deal of work still needs to be done to determine where and what impact this mercury is having on the region's seafood chain. Trinidad and Tobago, St. Kitts and Nevis, Jamaica and St. Lucia recently concluded a Minamata Initial Assessment project, funded by the Global Environment Facility, that enabled them to identify their top mercury polluters. The assessment represents a major step for the countries, all of which share the global concern over mercury contamination of the seafood chain that led to the ratification in August 2017 of the United Nation's Minamata Convention on Mercury. Public education on the issue is vital, said Tahlia Ali Shah, the assessment's project execution officer. "When mercury is released it eventually enters the land or soil or waterways. It becomes a problem when it enters the waterways and it moves up the food chain. Mercury tends to bioaccumulate up the food chain," she said. "So if people continue to eat larger predatory fish over a period of time" the levels of mercury in their body could increase. Mercury poisoning can lead to physical and mental disability. Ali Shah works for the regional project's implementing agency, the Basel Convention Regional Centre for the Caribbean (BCRC), which held a seminar in Trinidad in early October to apprise members of the public about the dangers posed by mercury. The seminar also shared with participants some of the results of the initial assessment and what citizens can do to help reduce mercury in the environment. The four countries plan to roll out public awareness campaigns on the issue, Ali Shah said. Meanwhile, Jewel Batchasingh, the centre's acting director, is concerned that the public not overreact to the fear of mercury contamination. She pointed out that fishing and tourism are important industries for the region, "and people tend to panic when they hear about mercury in fish." For now, no fish species commonly eaten in the Caribbean has been flagged as a danger, Ali Shah told IPS. 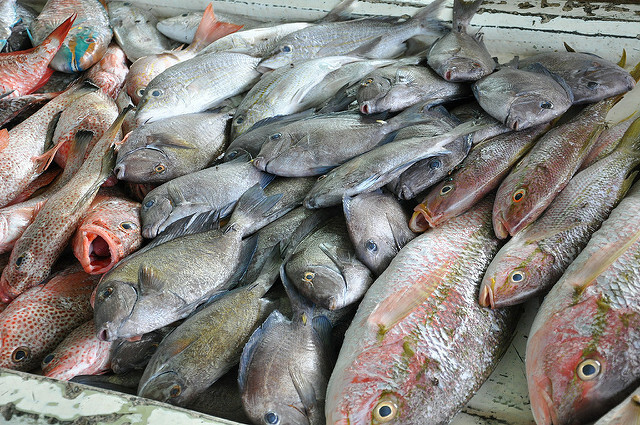 "It is only after years of testing the fish and narrowing down the species that we will be able to better inform consumers in the Caribbean about which fish are safest to eat and give fish guidelines." She said the current fish matrix developed by the Biodiversity Research Institute to provide guidance regarding safe consumption levels for various species does not readily apply to the Caribbean. A similar matrix is used by the United States Food and Drug Administration to provide guidance to U.S. consumers. The main source of mercury contamination for Trinidad and Tobago is its oil and gas industry, which is responsible for over 70 percent of the mercury released into that country's environment. For Jamaica, the important bauxite industry is the main source of mercury pollution, whereas for St. Kitts and Nevis and St. Lucia, the main source of contamination is consumer products. Though St. Kitts and Nevis and Jamaica are parties to the Minamata Convention, Trinidad and Tobago and St. Lucia are exploring what steps need to be taken to become signatories. St. Lucia wanted to take part in the MIA as a preliminary step. It recognised "that the problem of mercury pollution is a global problem that cannot be addressed adequately without the cooperation of all countries and that our population and environment was not immune to the negative impacts of mercury, we wanted to be a part of the solution by ratifying the Convention," said Yasmin Jude, sustainable development and environment officer and the national project coordinator for St. Lucia's assessment. "However, it was important to us that the decision to do so was from an informed position regarding our national situation and in particular, capability to implement the obligations articulated in the Convention." The MIA helped Saint Lucia "to get information on the primary sources of Hg releases and emissions in the country, as well as an appreciation of the gaps in the existing regulatory and institutional frameworks as it relates to the implementation of the country's legal obligations under the Minamata Convention on Mercury", on its way to becoming a signatory, Jude explained to IPS via e-mail. She added that at this stage "it is premature" for St. Lucia to state what its goals are with regard to controlling mercury contamination or to give a timeline for reduction of mercury in the environment, but the government's chief concern is to ensure "a safe and healthy environment for our people." On the other hand, St. Kitts and Nevis, as a signatory to the Convention, "will adhere to the timelines for certain actions as laid out in the Minamata Convention," Dr. Marcus Natta, research manager and the national project coordinator for St. Kitts and Nevis, told IPS. He said, "We will endeavour to meet the obligations of the Convention through legislative means, awareness and education activities, and other innovative and feasible actions." Keima Gardiner, waste management specialist and national project coordinator for the Trinidad and Tobago project, said one of the biggest challenges her country will face in becoming a signatory to the convention "is to phase out the list of mercury-added products" that signatories are required to eliminate by 2020. "This is very close for us. We are a high importer of CFL (compact fluorescent) bulbs and these bulbs are actually on that list of products to be phased out." As for the energy sector, which the recently concluded assessment shows is the country's main mercury polluter, "the idea is to try and meet with them directly to try and encourage them to change their practices and use more environmentally friendly techniques...and monitor their emissions," Gardiner said.